Join Father/Daughter Team Frank Whites Jr & Erika N Whites as they bring you 2 hours of complementing postures to enhance both practices. 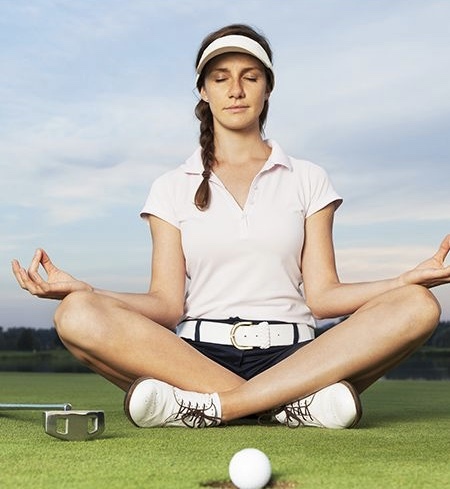 Yoga is a wonderful way to become physically tuned for playing golf. The very basis of Yoga is balance and symmetry; Yoga programs have long been used to eliminate body tension by returning the body to a balanced, symmetric state. Yoga guides golfers to develop equal strength on both sides of the body so that both sides perform equally well. In order to attain a truly good golf game one must develop a flexible, balanced body. Frank is a PGA Professional who teaches out of Airport Greens & has been honored by Golf Digest as a Top 100 Club-fitter in the America several times in recent years. Recently, Frank was featured at the Cleveland Golf Show on the main stage for his instruction. Erika is a ECYT/ERYT working on her 500 hr certification. She has taught in Cleveland for 6 years in various studios & for many exciting community events. She has also guest taught for for studios in Florida, Texas, Arizona, & Colorado respectively. After years of discussion of Golf & Yoga over chilled glasses of Chardonnay- Frank & Erika are thrilled to bring this program back to CLE!